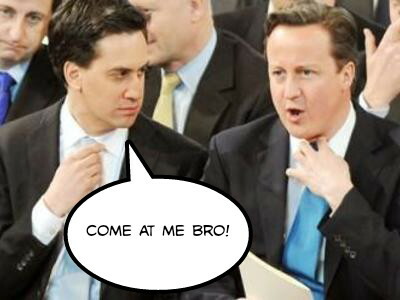 Screenkicker Showdown – Cameron and Miliband fight to the death! – Screenkicker! Are you excited yet? We get to vote for a new British prime minister this Thursday! OK maybe it isn’t the most exciting election ever being that its one slightly right of centre politician versus one slightly left of centre politician. It’s hardly House of Cards. Wouldn’t it better if the candidates had to fight to the death in a thunderdome with George Osborne and Michael Gove as some kind of unholy Master Blaster? That’s the question Screenkicker’s resident visual wizards/sexual deviants Chris and Denis asked the public at Edinburgh Comic Con this year. Who would win in a balls out fistfight between these incredibly dull men? Here’s what they thought. Have you got a showdown you’d like us to finally resolve? Wesley Snipes vs the IRS? Joss Whedon vs feminists? Old Renee Zelwegger vs New face Renee Zelwegger? Let me know in the comments below. No one remembers Skinner or what he looks like! Reese Witherspoon vs the velociraptors from Jurassic park? Kirsten Dunst vs Eliza Dushku in a “Hot body/weird face” contest. Hey! Leave Dushku’s face alone. Maybe Anna Kendrick could take her place. Hey! Leave Anna Kendrick’s face alone! i wish this is how the elections were really decided.